Model LN-EIR is one of the most compact and lightweight LED IR illuminators in the market and now it is also the most versatile LED IR illuminator with the fully adjustable IR beam: smooth brightness adjustment from 0.5mW to 120mW, beam-width adjustment from 3 to 6 degrees and X/Y position adjustment to ensure the beam is exactly in the middle of the field of view. 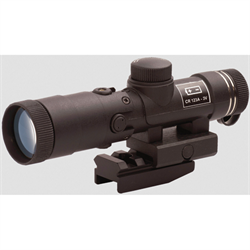 The powerful IR beam provides an effective viewing distance of up to 500 meters when used with Generation-3 night vision. Three versions are available – one with slide connector, one with a screw connector, and one with the Weaver/Picatinny rail bracket (see model compatibility list on the left). Each illuminator comes with the belt carry pouch and the beam adjustment tool.